Good product photography is all about highlighting the detail of a finely crafted object. Whether it’s the metallic bezel of a precisely engineered watch or the rich maroon hue of an expensive Bordeaux claret, knowing exactly how to deal with shiny and reflective surfaces are vital skills for any aspiring still-life and product photographer to master. Taking still-life pictures of glass objects can be especially tricky as you often get all sorts of problems, not least unwanted reflections and distortions. 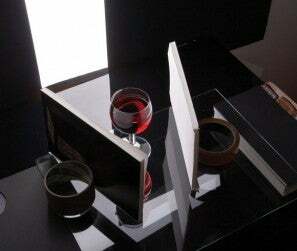 But there are several solutions that will make glass objects sparkle and gleam just the way you want them to. These techniques can also be used to bring out and enhance the colour of the contents of glass objects. In addition to a solid studio technique, digital post-production is an equally important part of the image-capture process. Through an understanding of the key tools of Photoshop such as dodge and burn, cloning, selection tools, levels and curves, saturation and suchlike you will find that you’re able to deal with those parts of the image that just do not look right in-camera, especially those elements that are difficult to light correctly. This page looks at photographing a watch and a wine glass using a single softbox as a light source. I have used a Canon 17-40mm L lens (at 40mm), which doesn’t appear to be affected by lens flare. Lighting shiny metallic objects such as a watch can be tricky, especially when you want to define its shape without losing its shiny metal qualities. I find the best way is to use sheets of black card in tandem with a diffused light source. Done correctly this results in a sharp, well-defined image with shiny surfaces. For this image I placed the watch on a table covered with white paper. 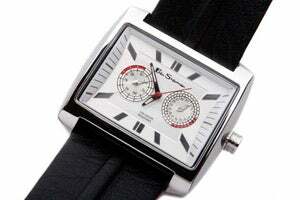 I then positioned a softbox close and above the watch to provide a soft, clean light. The output will depend on your kit, but I set my 200-watt strobe unit to 1/4 power. Exposure can be established with a few test shots. The watch should be slightly raised from the tabletop, and shot at an angle to avoid awkward reflections. In this example a piece of black card, positioned to the right-hand side of the watch was used in order to create a black edging along the chrome casing. I moved this card around until I was happy with the edging effect it created. When attempting this yourself, try cutting the card and experimenting with different shapes. For this image I placed a piece of card in front of the watch to make the nearside top casing of the watch completely black. This also created black lines to the left- and right-hand sides that I later tidied up in Photoshop. The Dodge tool in PS can be used to make the background pure white. 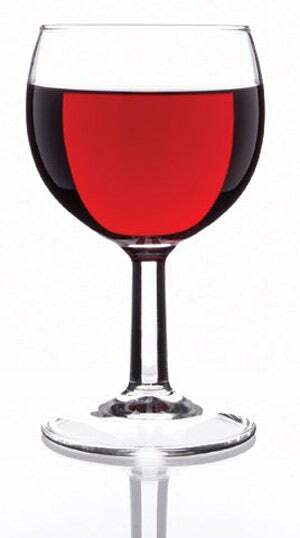 Wine Glass, White Background (right): Glass is reflective and transparent, which can pose problems when photographing it. I find the best way to shoot glass is against either a plain black or white background using sheets of white and black card to highlight its form and content. For this shot I filled a washed and polished wine glass with (slightly diluted) red wine and placed it on a sheet of clear glass raised several inches off the top of a table (see set-up pic, top right). The table had a sheet of black PVC on it to minimise glare and the softbox was placed behind the glass. To create the black curved shapes on either side of the glass I placed two pieces of large foamboard covered with black card directly in front of the softbox, leaving about a six-inch gap of light to shine through the glass. Blocking out as much light from the softbox as possible reduces the chance of lens flare. I then moved the glass closer to the softbox, which made the black shadows look smaller. To compensate I widened the light gap to 10 inches. Notice how moving the card on the left affects the shadow created on the right-hand side of the glass and vice versa. Once satisfied with the shape, I placed two white cards on either side and in front of the glass to provide some modelling in the dark areas. Finally, I used Photoshop to remove unwanted reflections, and to add a soft glow. Wine Glass, Black Background (Right): In order to create the opposite effect in the glass I first masked the softbox with black card so as to create two strips of light. 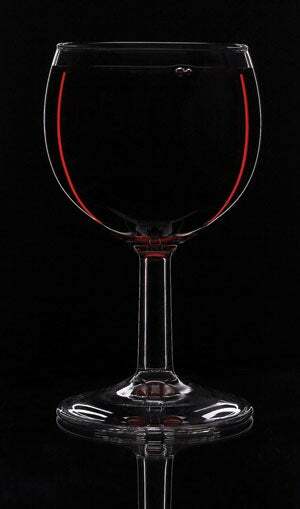 I also used black card to create a black background for the wine glass. I also chose to create some bubbles at the rim of the glass by disturbing the liquid. Bubbles don’t always stay though, so it is useful to have an assistant! As with the first shot, by moving the wine glass towards and away from the camera and adjusting the size of the strip of light the effect on the glass will be apparent.